The origins of Simca date back to 1922 when Teodoro Enrico Pigozzi was sent to France to buy scrap metal for the FIAT works. Instead, he settled in France, was appointed FIAT’s main distributor, and began manufacturing cars in 1928. Early post-war Simcas followed the FIAT theme. In 1954, Simca’s purchase of Ford France allowed them to enter a more expensive market and they began building cars with complete autonomy from FIAT. 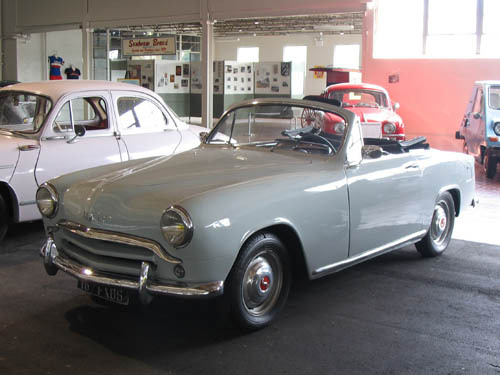 The Simca Aronde comes from the French word for “swallow” (the bird). This car, based on an Aronde chassis, was the prototype for the “Weekend” two door convertible. This is the actual car given to Brigitte Bardot for promotional purposes. Miss Bardot did advertising for Simca with this car and owned it for many years. The aluminum and steel body was hand made by the Coach Building Company, Facel. It carries serial number 001.